***this post is in collaboration with Anolon. All opinions are my own. As always, thank you, thank you for supporting the brand that make this blog possible. You guys are the best! As I get older, I am finding that quality is much more important than quantity to me (as is evidenced by many, many of the posts on this blog). I would rather have one great pair of jeans that makes me feel like a million bucks than 10 pairs of jeans that make me feel fat or ugly. The same is true in my kitchen. I want to love all my dishes and cooking equipment, and have them last for a long time, especially now that I am blogging and need to take photos of a lot of my food. Good and beautiful cooking equipment is essential for me. For a long time, we only had two small frying pans, and many of my recipes had to be transferred mid-cooking, because they were overflowing. It was the worst. Then I got this gorgeous stainless steel frying pan from Anolon . It was life changing. Seriously. It is huge, so it holds a large salad like this one pictured here, my pot pie sauces and just about anything else you could throw at it. It has a nice large lid , and has a fancy copper stripe around the bottom right above the base. And it cleans up beautifully. It is a heavy, high quality pan that will last me for years. And I really look forward to keeping it for a long, long time. If you need a new pan, this one's for you. Trust me, it is fabulous, and you won't regret it! 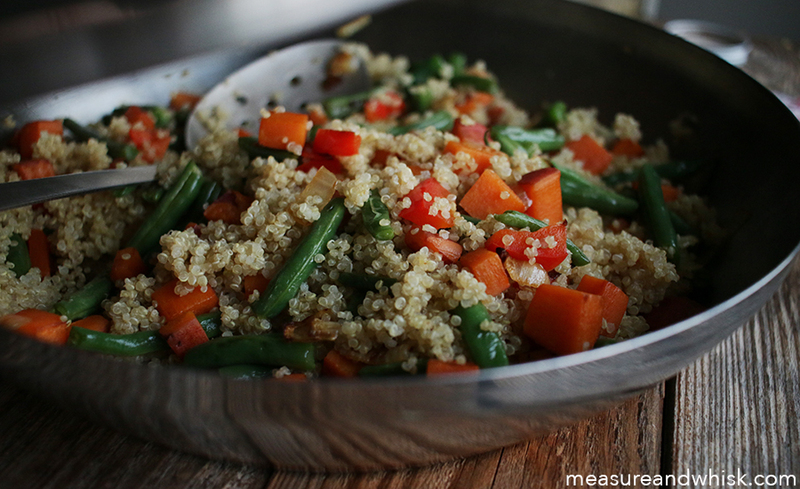 In your fabulous Anolon 12" skillet, heat your oil over medium on the stove. Add the onion and carrot and sauté for about 7-8 minutes, until the carrots begin to soften and the onion is translucent. 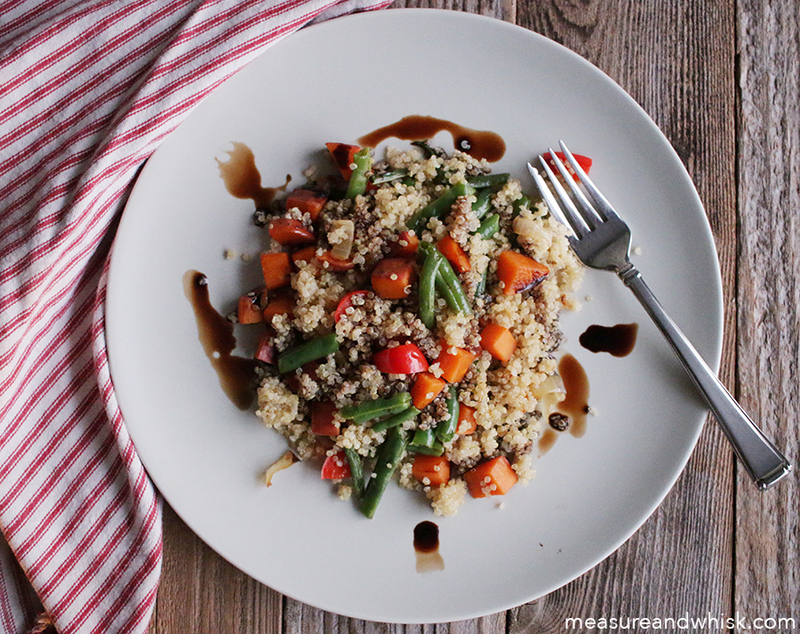 In a smaller pot or frying pan, heat the balsamic vinegar over medium, until it begins to boil. Turn the heat to low and let it cook for about 3 minutes, until it thickens (turn on your stove vent, or you might pass out from the fumes). While the vinegar is reducing, add the beans, and pepper to the frying pan with the onions and carrots, and cook them, stirring occasionally for another 2 or 3 minutes. 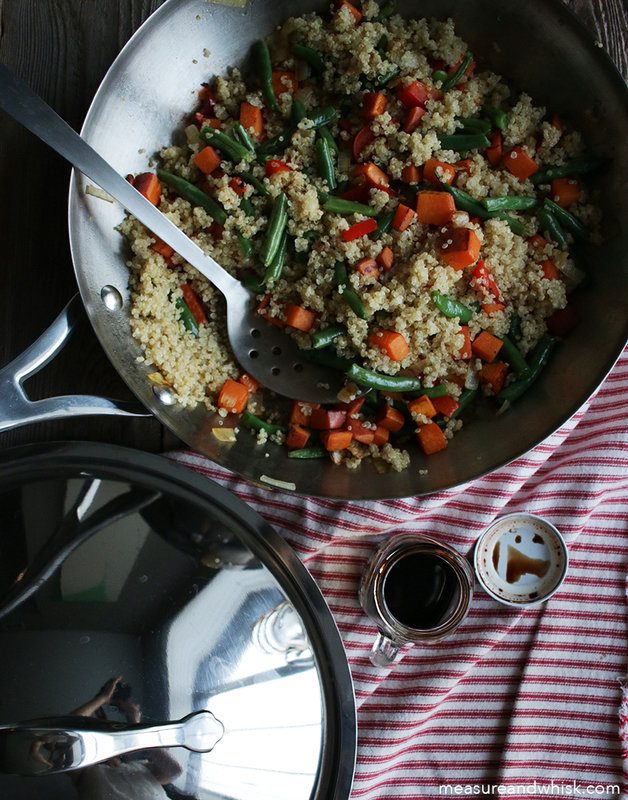 When the beans and red pepper are beginning to soften, add the cooked quinoa, and stir. Remove from the heat, and plate. Pour the reduced vinegar over the top, and enjoy.